Daniel Savaria of Collegeville is a 4th year medical student at Gesinger Commonwealth School of Medicine (GCSOM). He is a 2012 graduate of Muhlenberg College and received a master of biomedical science degree from TCMC in 2014. It is fair to say that most of you have heard the phrase, “diet and exercise are the “magic pills.” One very good variation on the analogy says, “Exercise is a magic pill that takes just 30 minutes per day to swallow.” Despite the ubiquity of the sentiment, in the case of breast cancer, current medical research, including a project being conducted at GCSOM, leads me to believe that the public can’t hear the advice often enough. Before we explore why maintaining a healthy weight is so important to breast cancer prevention, let’s begin with some background. This Breast Cancer Awareness month, there are several things women – and men – should know about this common and feared disease. First of all, breast cancer is not a single disease and is much more complicated than what can be disseminated in the general news media. There are several kinds of breast cancer, including its most common form, estrogen- or progesterone-receptive. Estrogen-receptive cancer has some very good, targeted treatments, including drugs like tamoxifen and anastrozole, which block estrogen effects. Another type of breast cancer, which is less common, is HER2-receptive breast cancer. As the Mayo Clinic explains, “HER2-positive breast cancer . . . tests positive for a protein called human epidermal growth factor receptor 2 (HER2), which promotes the growth of cancer cells.” As in the case of estrogen-receptive cancer, HER2-positive cancer has a very effective, targeted treatment: trastuzumab. This drug is an antibody that interferes with the HER2/neu receptor. A third and more aggressive type of breast cancer is Triple–negative breast cancer (TNBC). It is frequently diagnosed in younger and premenopausal women. Since TNBC tests negative for estrogen and progesterone receptors, as well as HER2/neu, it is unlikely to respond to hormone-and/or HRE2-based therapies. Due to its aggression and the lack of a targeted treatment, TNBC can difficult to treat. According to the National Breast Cancer Foundation, TNBC “occurs in about 10-20 percent of diagnosed breast cancers and is more likely to affect younger people, African Americans, Hispanics, and/or those with a BRCA1 gene mutation.” Also, this cancer is more likely to spread and recur. Therefore, finding a way to block growth and proliferation of TNBC cells would be an important tool for treating this fast-moving cancer. I have had the privilege of assisting in the lab of GCSOM scientist, Dr. Raj Kumar, where he is exploring the overarching goal of identifying what drives TNBC growth and determining how to stop it. Stress hormones, like cortisol, and obesity/metabolic syndrome appear to play a role in TNBC. Discovering a way to block stress-hormone cell receptors could lead to a targeted treatment, something not available today. Dr. Kumar’s lab is currently pursuing a way to target this pathway for drug development. However, if obesity is unequivocally linked to cancer cell proliferation, as we believe it may be, perhaps we already have something infinitely better than treatment – prevention. Control your weight. The National Cancer Institute (NCI) says there is an increased risk of postmenopausal breast cancer in obese women. NCI explains, “After menopause, when the ovaries stop producing hormones, fat tissue becomes the most important source of estrogen. Because obese women have more fat tissue, their estrogen levels are higher.” NCI further notes that the relationship between obesity and breast cancer risk may also vary by race and ethnicity. There is limited evidence that the risk associated with overweight and obesity may be less among African American and Hispanic women. Be physically active. Physical activity can help you maintain a healthy weight, which, in turn, helps prevent breast cancer. For most healthy adults, the Department of Health and Human Services recommends at least 150 minutes a week of moderate aerobic activity or 75 minutes of vigorous aerobic activity weekly, plus strength training at least twice a week. Limit alcohol. In addition to being linked to cancers of the mouth, throat, larynx and esophagus, excessive alcohol use has also been implicated in cancers of the pancreas, liver, colon and breast. Don’t smoke. The American Cancer Society notes that the 2014 U.S. Surgeon General’s report on smoking concluded that there is “suggestive but not sufficient” evidence that smoking increases the risk of breast cancer. Nevertheless, not smoking is one of the best things you can do for your overall health and certainly lowers your risk for other types of cancers. This October, while supporting every good observation aimed at raising awareness and raising funds to defeat breast cancer, take time out to review how often you take the exercise pill. Swallowing it for a little over 20 minutes every day will have protective effects on your body that are almost magical. Medical Reviewer: Raj Kumar, PhD is Director of Research and Professor of Biochemistry in the Basic Sciences Department at GCSOM. 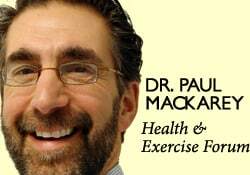 Read Dr. Mackarey’s Health & Exercise Forum – every Monday. This article is not intended as a substitute for medical treatment. If you have questions related to your medical condition, please contact your family physician. For further inquires related to this topic email: drpmackarey@msn.com.Paul J. Mackarey PT, DHSc, OCS is a Doctor in Health Sciences specializing in orthopaedic and sports physical therapy. Dr. Mackarey is in private practice and is an associate professor of clinical medicine at GCSOM.